There is huge demand for cannabidiol (CBD) due to its medicinal benefits for a wide range of health concerns, and it's also been showing up in topical skincare and body care products. Just like most substances, there's a big difference between getting CBD into your bloodstream though oral tinctures and vaporization vs absorbing it through the skin via a topical skincare product. Cannabidiol, or CBD, is a cannabinoid derived from varieties of the cannabis plant. Cannabinoid is a term used to refer to chemical compounds that are found in the cannabis plant and/or that interact with cannabinoid receptors, as well as the derivatives, and transformation products of those compounds. There are over 80 different cannabinoids found in these plants, but THC and CBD are the most common. CBD on its own has no psychoactive properties, whether its taken orally or applied topically. What are the sources of CBD? A few studies suggest CBD may help reduce anxiety, insomnia, pain related to arthritis and fibromyalgia, and general muscle and joint pain. However most of the research on CBD has been focused on reducing certain types of seizures. Just last month, the end of June 2018, the US FDA approved Epidiolex, a CBD oral solution for the treatment of seizures associated with two rare and severe forms of epilepsy, Lennox-Gastaut syndrome and Dravet syndrome. This is the first FDA-approved drug that contains a purified drug substance derived from marijuana. Under the Controlled Substances Act (CSA), CBD is currently a Schedule I substance because it is a chemical component of the cannabis plant. In support of this application, the company conducted nonclinical and clinical studies to assess the abuse potential of CBD. As part of the approval process, Epidiolex must be rescheduled from its current Schedule I before it can be made available to patients. They state: "Rescheduling is expected to occur within 90 days and Epidiolex is expected to be available to appropriate patients by Fall 2018." I believe if a big pharma has a version coming out, there must be something to this. On the flipside to "CBD only" over the counter products or pharmaceuticals, there is also a widely debated category of utilizing a combination of cannabinoid compounds for maximum benefit, commonly referred to as the "entourage effect." For an up to date detailed list of published research including cannabinoids, click here and here. If CBD is still considered a 'Schedule I substance' then how is it being sold in health food stores across the nation and online? Confusing is an understatement. In November 2017, the FDA has written warning letters to companies selling CBD products outside of a legal, licensed cannabis store, but that doesn’t seem to be stopping sales and availability. On a federal level, the DEA considers it illegal- but CBD laws vary from state to state. Rod Kight, a lawyer that specializes in business law and cannabis policy, has written excellent posts that get into legal technicalities of CBD. He says CBD is legal or not, based on its source and the jurisdiction in which the plant is cultivated. I've seen CBD products online and even at my local healthfood store here in NYC, where only medical (not recreational use) is legal. Am I actually getting a real CBD in a product if isn't purchased from a licensed retail cannabis store in a cannabis legal state? The answer is....maybe? A big factor is where its purchased from. If adult use cannabis is legal and regulated in that state, then the CBD products available in licensed retail cannabis stores must pass state-mandated lab tests to assure their potency and purity. Outside of those tests, consumers must put their trust in the manufacturer. More legalization will most likely lead to more quality control. The FDA did a random test on some CBD products in 2016 and they found some had less CBD then what was advertised. Only two of the 24 CBD products from eight companies passed the agency’s test for having the amount of CBD in the product that matched the amount claimed on product labels. Also doing testing was the Journal of the American Medical Association (JAMA). They published research letters with results of research done on the labeling accuracy of products sold in dispensaries online (2017 letter) or in shops (2015 letter). More legalization will eventually lead to more quality control. What if you don’t get your CBD product at a legal, licensed cannabis store but online, a heath food store or random retailer? Consumer Lab's advice is to look for products that list the amount of CBD per serving, not just per bottle. If a product lists only “cannabinoids” it may contain CBD but you won’t know how much. Products that list ‘hemp extract’ may have significant amounts of CBD, but don’t expect any CBD if ‘hemp oil’ or ‘hempseed oil’ is the only ingredient. Some companies are changing the CBD wording on their products and websites in an attempt to avoid government interference. This is great story on how some brands are facing hurdles selling CBD infused skincare. Now what about CBD in skincare? There were some studies early on that showed CBD could have a myriad of skin benefits. In 2009, The Department of Physiology at the Research Center for Molecular Medicine said "The newly discovered endocannabinoid system (ECS; comprising the endogenous lipid mediators endocannabinoids present in virtually all tissues, their G-protein-coupled cannabinoid receptors, biosynthetic pathways and metabolizing enzymes) has been implicated in multiple regulatory functions both in health and disease. Recent studies have intriguingly suggested the existence of a functional ECS in the skin and implicated it in various biological processes (e.g. proliferation, growth, differentiation, apoptosis and cytokine, mediator or hormone production of various cell types of the skin and appendages, such as the hair follicle and sebaceous gland). It seems that the main physiological function of the cutaneous ECS is to constitutively control the proper and well-balanced proliferation, differentiation and survival, as well as immune competence and/or tolerance, of skin cells. The disruption of this delicate balance might facilitate the development of multiple pathological conditions and diseases of the skin (e.g. acne, seborrhea, allergic dermatitis, itch and pain, psoriasis, hair growth disorders, systemic sclerosis and cancer)." There was a 2014 study that used biopsies of human scalp and arm skin to try to determine whether CBD could suppress acne. This also showed potential anti-inflammatory effects. Research has also been done on human cells, suggesting there could be applications for inhibiting hair growth, managing skin disorders characterized by sebaceous gland dysfunctions, and sweat gland derived disorders (some tumors) characterized by unwanted growth. This is a comprehensive list of dermatological studies. Botanix Pharmaceuticals, a dermatological company, just announced the completion of its Phase 1 clinical trial for an acne drug that incorporates synthetic cannabidiol (CBD). Zynerba Pharmaceuticals has been conducting a Phase 1 study in Australia of its drug ZYN002, a synthetic CBD gel. This gel is aimed at treating epilepsy and osteoarthritic knee pain. The says the clear gel is designed to provide consistent, controlled, and sustained drug delivery in twice-daily dosing. 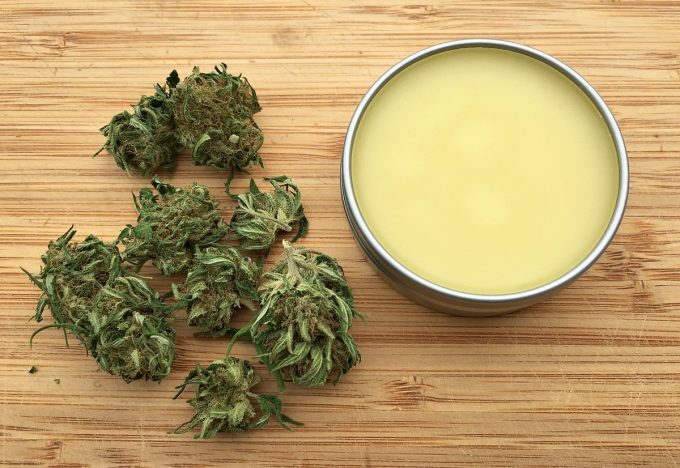 Easily attainable cannabinoids were first being sold and used in topical products to treat localized pain relief, muscle soreness, tension, and inflammation. There are products even making claims to treat psoriasis, dermatitis, and cramping. The endocannabinoid system consists of many cannabinoid receptors, and a large portion of these are found in the skin. The concept in using it in beauty & skincare is that CBD has antioxidant properties and an impact on controlling skin inflammation, which would then make it useful for treating a multitude of skin issues. Keep in mind, as with any ingredient that doesn't have a ton of research yet, the other ingredients in the product also play a role. Also, while cannabinoids seem to be showing potential in the dermalogical issues, potential side effects and negative consequences haven't been discussed in most of the research I looked at. Additionally, I can't find information on the pros and cons of endogenous cannabinoids versus synthetic cannabinoids. Almost any beauty product retailer (at least here in NYC) carries at least one beauty product with CBD, whole-plant phytocannabinoids, or hemp extract. There are retail websites with beauty sections dedicated to it, and one I found that exclusively only carries cannabis beauty products. I've been buying some to try, and will report back on that soon! If legalization and research continues to grow, we will start to understand and learn more about cannabis as well as the endocannabinoid system and its receptors- and I predict an even bigger market for these products will begin to develop. Mar 18, 2015 It's..Spring Break! Oct 1, 2014 Happy Hour - For Your Face!